Sleepy Hollow. Mandalay Pictures 1999. 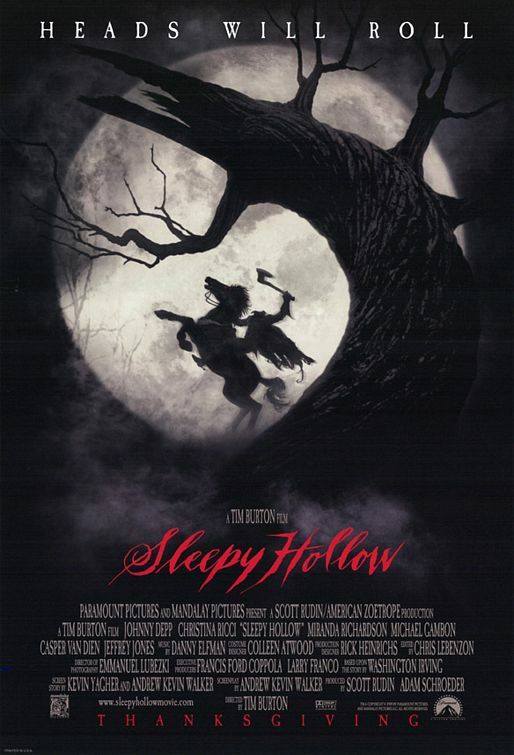 I principally know the story of The Legend of Sleepy Hollow through the Disney featurette. Wishbone did an adaptation, but it was the second season that I’m much less familiar with. It would be easy to go more into why Crane gets involved with the Horseman legend than the Disney version did, but it seems to pretty simply be that he’s spooked by the legend and happens to become a victim of the ghost. Well, it was a short story to begin with, so there’s not much need or room for motivation. In this version, apparently they’ve changed him from a superstitious schoolteacher to a detective. Which would let him drive the plot, so it might be a good change. Definitely means this is going to be very different. Constable Ichabod Crane wants to bring scientific methods to the late-18th century New York City police force, much to the annoyance of his superiors, who send him to the small village of Sleepy Hollow to prove himself with a serial decapitation investigation. The locals tell him the murders were done by the risen corpse of a brutal Hessian mercenary from the War of Independence, searching for his own lost head. A confident man of science, Crane is absolutely certain the culprit is a mundane, living killer until he encounters the Horseman himself. As his investigation finds a pattern to the victims, Crane is forced to confront his prejudices against superstition, his weak constitution, and resurfacing memories of his childhood. This is somehow less Tim Burtonesque than Batman, which is a fairly straight movie. The Hessian’s design, the design of the Tree Of The Dead, and the magnifying headset that Crane uses are the main things that stand out as Burton’s kind of heightened reality. Otherwise, the look and feel are more like any other high budget period fantastic horror. Not that I can think of many period horror films. The effects mostly hold up well. There’s some CG that’s a bit overconfident, but I was sure the Horseman’s lack of head was mostly a really well-constructed practical concealment when in fact, the actor was wearing a blue hood they keyed out and painted into the hole. While I’m really impressed with how Crane’s severe discomfort with gore and fainting spells demonstrate a character who is thrust into a situation he’s not fully equipped to cope with, it mostly left me wondering how he managed to become a police constable that we never see tackling anything but murder cases. I can see where Depp got the inspiration from the original story, but it makes more sense for a schoolteacher than a criminal investigator. Mostly I’m pleased to see the big names filling the supporting cast, but I’m conflicted about Christopher Walken as the headed Horseman. It’s both an excellent creepy role for him and also feels like a waste, since he’s only got a head in two or three scenes and is more goofy than vicious. He’s creepy, but not scary. While I don’t think Crane’s childhood traumas added much to the plot, this is mostly a fun, interesting retelling of a ghost story. I would have liked to see more done with the science versus superstition angle after Crane is forced to believe in the apparition. I’d like a more faithful adaptation too, but a lot of the things I did like about the changes rest on some of the things I didn’t. I’ll still enjoy this for what it is though.